I really love the look of wooden flooring and since we moved to a house with carpets in every room, I can't stop thinking about all the pros of having laminate. It is very easy to keep clean, more friendly for those with allergies and... it simply looks better in my opinion. Toddler + carpet = hell. I am really looking forward to designing our own house and believe me... it will have hard flooring in every room. If I start to miss fluffy carpets, I will simply get a nice rug. They are great in winter, when hard flooring gets really cold (unless you have underfloor heating). 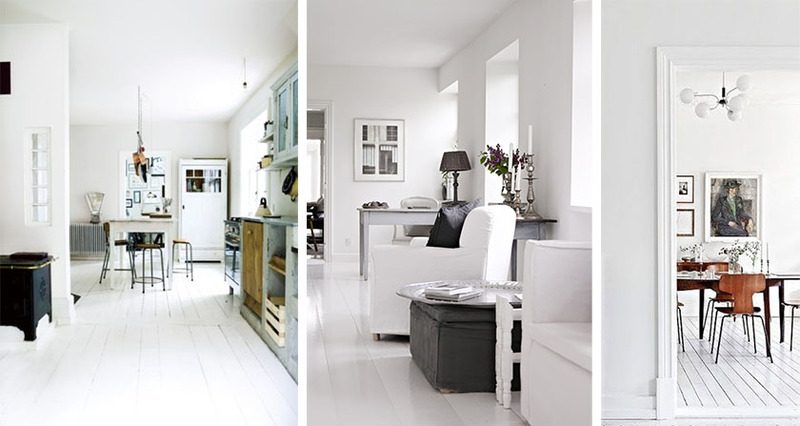 If you are a Pinterest addict, you will know how amazing white wood flooring looks in living rooms and bedrooms. It looks absolutely incredible and makes the whole room appear bigger, brighter and airy. If I had to pick a colour for the bedroom, I would definitely go for white or off-white, but for the living room or dining area, I would go for the chateau white rustic flooring (see photos below). It looks fantastic and I have never seen anything like it. It resembles old wine and fruit crates and adds a lot of character to the decor. Now please excuse me, while I start planning the decor of my future home :) I feel inspired..